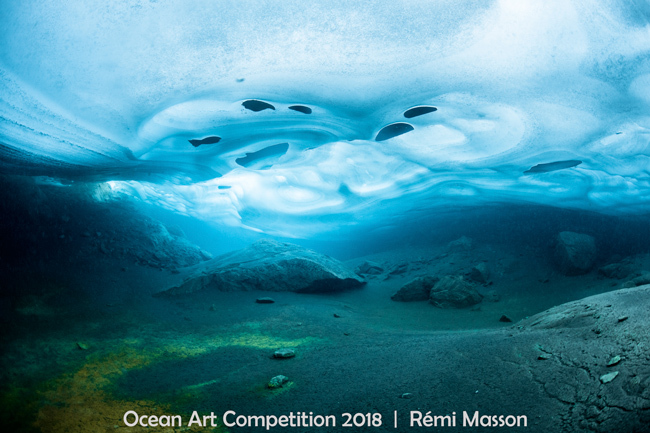 The Story: Facing the Mont-Blanc, at nearly 2600m altitude, in water at 0°C covered with several meters of thick ice, a few filamentous algae manage to develop on the rocky bottom. A precarious life but essential to the rest of the food chain. Image taken while free diving under the ice. Although it was July, the lake was almost completely frozen. To be able to dive under the ice, I used a natural opening created by the fracking of the ice at the beginning of the thaw.